Kanklean specialise in cleaning residential homes. With over twenty years experience, we know exactly what is involved in caring for every fabric , surface and space in your home. 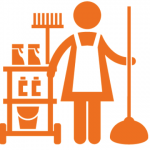 Our professional cleaners are trained in all aspects of home cleaning including modern surfaces and materials. A separate quote can be provided for these services. This list is reasonably comprehensive but we will also apply common sense when cleaning and our eye for detail will impress. Our teams are fully insured, trained, security checked and bring all the necessary products and equipment needed to complete the job.